In our last post, we explained why it’s important to test your emails before they go out. There are many benefits to incorporating this practice into your email marketing program, from catching typos and grammatical errors to ensuring optimal image display and maximum delivery. But the biggest benefit of all is a little more abstract. Picture this: you’ve created a phenomenal email. One of your best ever, in fact. It’s got highly compelling content that’s relevant to your subscribers, gorgeous images, and a call to action that’s practically irresistible. This email is so good, you can’t wait to put it out there and watch the clicks and conversions start rolling in. So you’re really tempted to just pull the trigger and skip the whole testing phase. After all, you know your email is practically perfect. If Shakespeare had a mailing list, would he have tested different versions of his plays to see which one got the best response? Let’s take a look at each of these stats in more detail. Email marketing best practices dictate that testing be performed for each mailing you send out. And it makes sense! Why would you want to distribute what would otherwise be a broken email message to your carefully cultivated audience? So many things could go wrong (e.g., improperly formatted HTML, images not loading as planned, incorrectly entered merge tags, etc.) that it’s worth the extra few moments to ensure that your communications go out without a hitch. But that’s just testing for delivery. How about testing for effectiveness? Testing your email content — and in a larger sense, your message — is an often overlooked step in the email marketing process despite it being a best practice. And it’s kind of silly that it’s so often forgotten about, really. Why wouldn’t you want what you send to be the most effective it could be? Much as you want to ensure the technology supporting the transmission of your communication is functioning as intended, you should also see to it that your message is producing the results you set out to achieve. But how do you do that? What do you change to make your campaign more effective? How do you measure this change? Given its undeniable tie to the success of your campaigns, email testing is a pretty big deal. And unless you are 100% satisfied with your email marketing effort’s performance as is, it’s a big deal that you should probably address. But don’t fret; while it may seem somewhat complicated, fundamentally it’s a pretty simple process. 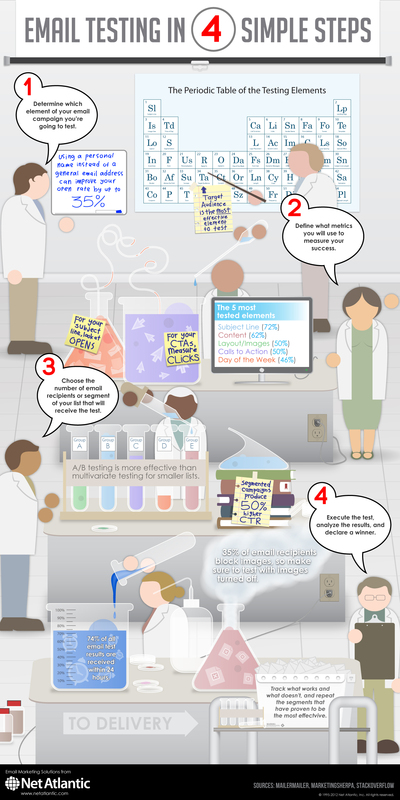 Our Email Testing In 4 Simple Steps infographic illustrates exactly how simple it is. With any advertising approach that involves a mailing strategy, campaign testing is a vital component in getting the best return results with the resources you have available. Direct mailing has been the foundation of companies’ marketing strategies for generations, and still remains a dependable and reliable source of getting your message sent straight to the mailboxes of your customers. However with the expansion of the ever popular social media methods, DM is often the first thing to be eliminated. Because of this, it is important to adapt and expand your methods and focus on email marketing and the right type of campaign testing to prove that the physical piece alongside online mailing is still bringing in returns. Is Your Email Campaign Missing the Mark? Honing in on your target audience will help you sharpen your message. A well-planned marketing campaign should take place before you hit the send button. To achieve success, targeted email marketing campaigns take time and patience. Many marketers make the mistake of batching-and-blasting to their entire email list. Rather than using a “one size fits all” approach, focus your marketing efforts and hone in on your target audience. Honing in on your target audience will help you sharpen your message. Is the content relevant to my subscribers? Does the email look good? Does it reflect a positive image of my brand? Am I getting the right message to the right subscriber at the right time? Would I respond to the message if I got it? I’m sure you’ve read it before: employing testing as an optimization tactic has been proven to be an extremely efficient means of increasing email marketing performance. What you may not have read is that the most widely used testing strategies are not always the most effective. I am sure, like me, your summer officially begins right about the time your burger (or grilled entree of choice) hits the grill on Memorial Day weekend. This means more time out of the office for you and well most of your consumers if you are a B2B marketer. With more people out of the office and less people to see your email campaigns when they hit your subscriber’s inboxes, here are some things you can do this summer to heat up your email marketing. Since people will be reading their emails while on the go or away from the office, they are more likely to be viewing their emails from a mobile device. Test your emails for readability on mobile screens before sending them. Email marketers often see their results slipping–fewer opens, a lower click-through rate and a dropping conversion rate–and panic. That’s understandable when the bottom line is at stake, but panicking won’t help you figure out what’s wrong with your email marketing strategy or how you can fix it. The only thing that can help is to test, test, test … and then test some more!